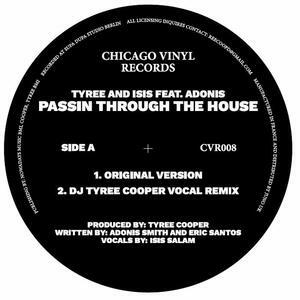 The Chicago Vinyl series continues to act as a vessel for ever more essential club tackle from the one and only Tyree Cooper. On this occasion he's collaborating with celebrated vocalist Isis and the legendary Adonis for this absolutely storming tribute to the heritage of Chicago house music. The original "Passin Thru The House" is a consummate jack track, shouting out all the right names and letting the 707 fills rip through the groove. Tyree then offers up three alternate mixes of the track, from the bugging "Vocal Mix" to the uplifting melodious form of the "Vocal Soul Remix." There's an instrumental version tacked on if you need it, but it's all about Isis' killer vocal on this 12".